Part of Jillaroo State, Tuvalu Straits was the northwestern-most simulator on the Irukandji Continent. 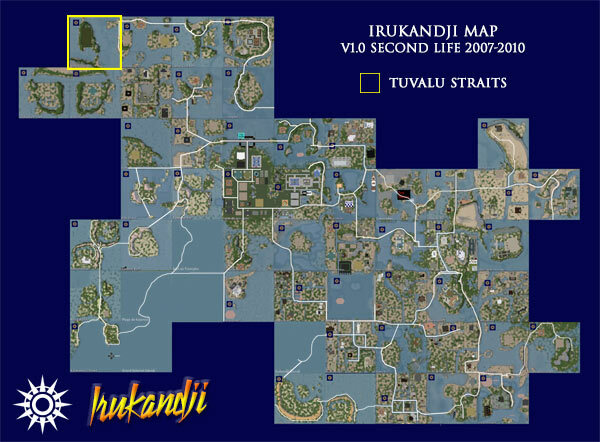 I had originally intended to give Tuvalu Straits a mirrored companion sim to the immediate west, but demand in the region petered out so it never eventuated. Regardless, Tuvalu Straits was a successful island and enjoyed 100% occupancy during its lifetime. Clockwise from east, its neighbouring regions were Barramundi Bay, Jackaroo Island, Yeppoon Atolls, and Great Keppel Island. Terraforming on Tuvalu Straits was done by hand, based on an initial template copied from Upper Aboyo Passage, then rotated 90 degrees. Unfortunately, due to a hard drive crash from that time, it looks like no photographs of Tuvalu Straits have survived. It was however a well-photographed island and I hope that some pictures do surface in the future. If you happened to have visited Tuvalu Straits and took photos and wish to share them on this page, please let me know via the comment section below.